The modern bathrooms of today, have become a place of refuge and relaxation, to release the tensions of the day. 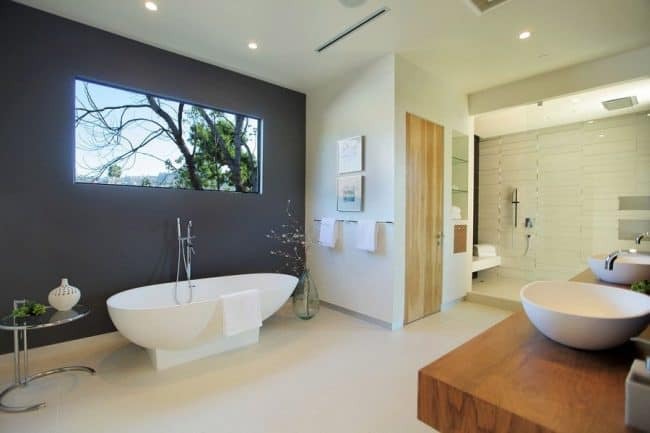 The design periods of simple bathrooms are already far away, nowadays there are new trends and accessories, such as towel heaters, soap dispensers, showers with heads on the walls and ceiling, tubs, jacuzzis, place for television, among many other amenities. The renovation of the bathroom is a great investment in time and money, so it is important to plan everything before you start. You must establish a budget and find the right designer before the upgrade. If you need inspiration, here we will show you the latest trends 2019 and many photos, to help you clearly establish what you want and need. 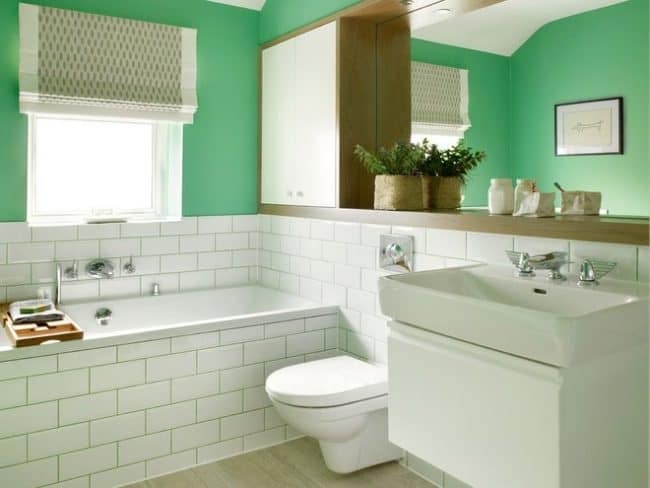 At first glance it may seem that the bathroom is the most inconsequential space in the house, but if you think about it better, you will see that it is one of the places where you spend a lot of time. So why not let your imagination fly free and you can turn this space into a place full of style and beauty? And this is where we can help you. 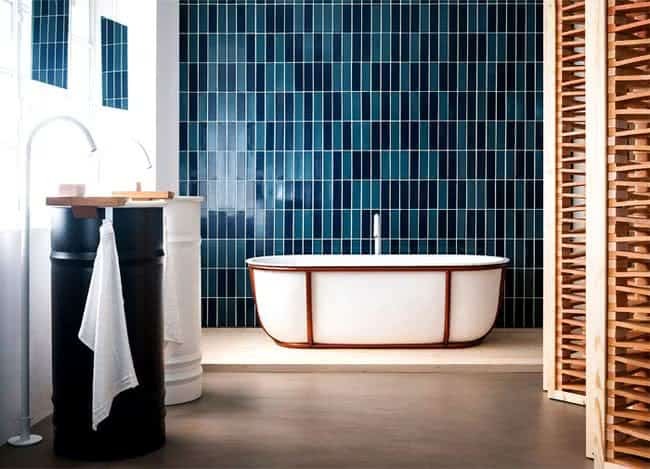 What are the trends for next year in bathroom designs, colors and materials? The year 2019 will be marked by the return to organic and natural. The colors will be super clean, the lines seamless and the layout of the spaces will be practical and simple, but with a touch of organic and elegant comfort. When a combination of modern and organic is used, a clean and elegant atmosphere is created. For example, the juxtaposition of wood and stone is one of the most beautiful options. In the image we see a bathtub of reduced dimensions, which is placed between the heat of the wood and the brightness of the ceramic tiles. A combination of easy-to-maintain supplementary materials. A modern but homely composition. This balanced atmosphere can be achieved by combining classic and modern, minimalism and warmth, innovation and nature. 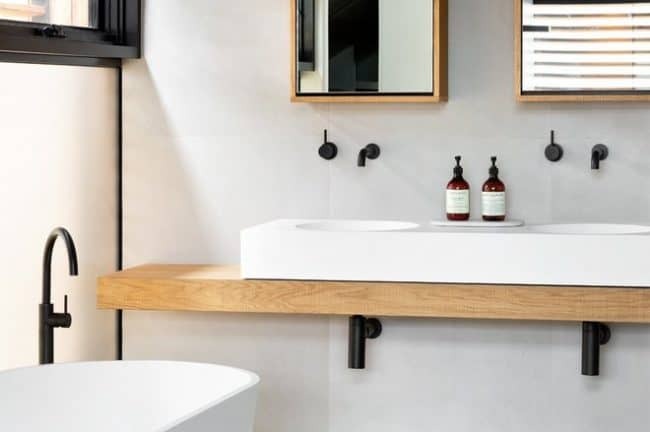 One of the new trends in bathroom design rediscovers the old organic connection between clay and water. 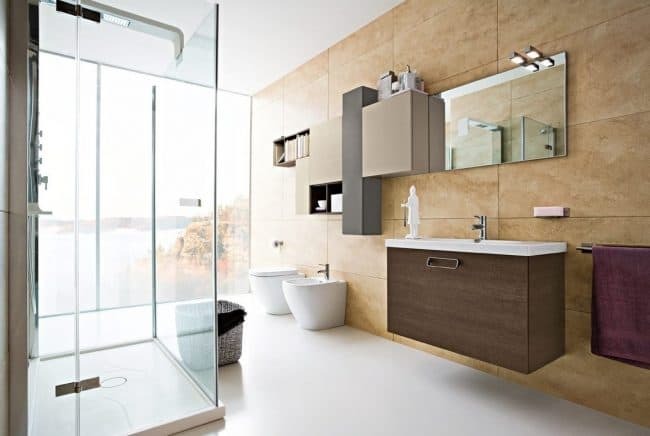 In the cultural history of humanity, clay is one of the oldest materials used to create containers for the containment of water and even today remains one of the main materials for the creation of bathroom accessories. The designer Werner Aisslinger found that the most plastic, natural and free material is clay and he used it without limiting his imagination. 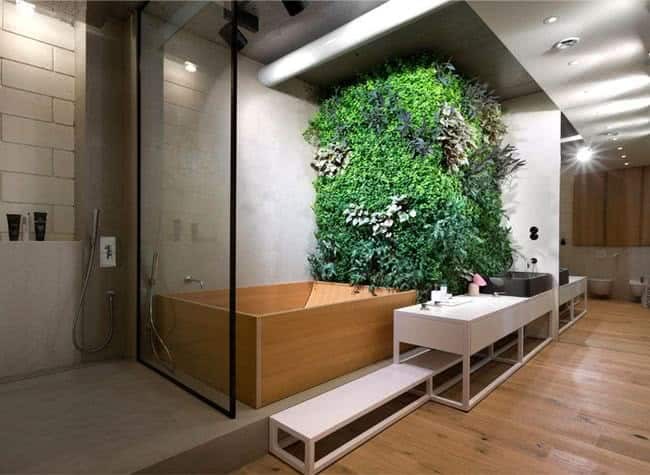 Do not forget to include green, the plants in the bathrooms are not only fashionable, but also give a wonderful touch to the designs. Another natural material that brings back the domain of nature in our homes is, without a doubt, wood. It is being used mainly as a shower floor covering. 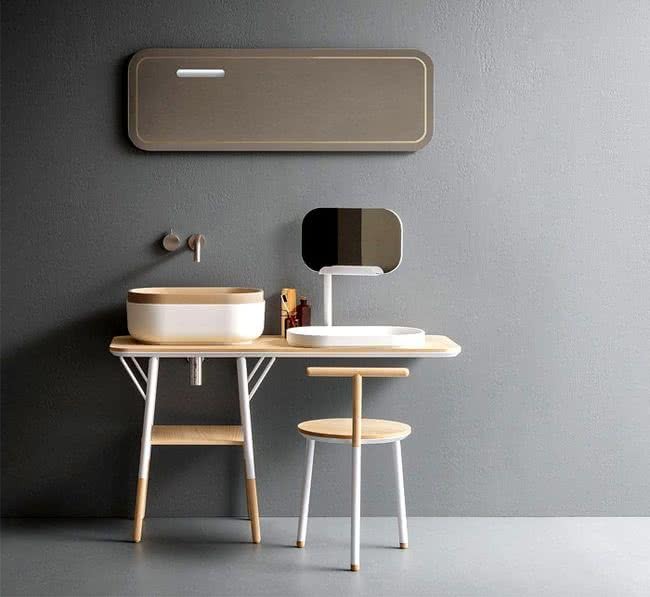 This project by Piero Lissoni for Boffi and his Garden series gives us an excellent example of elegant combinations between natural materials that may be suitable for a modern bathroom design. 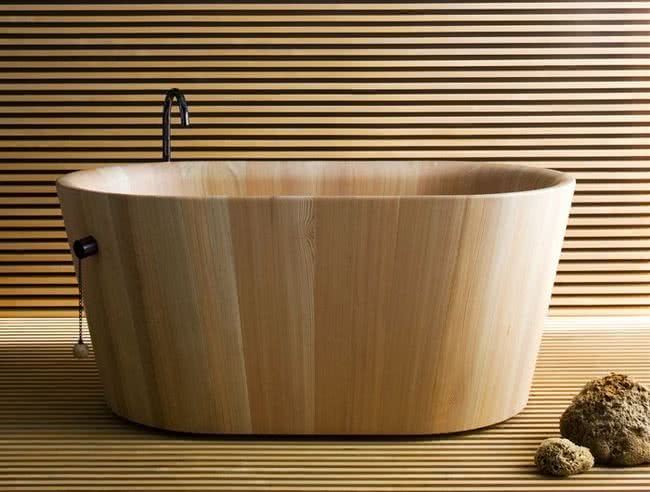 A wooden base with stainless steel accessories, an innovative and classy combination. The presence of clean and fresh wood texture in the design provides a touch of luxury to the composition. Dark colors make a great comeback in the interior design fashion scene this season. 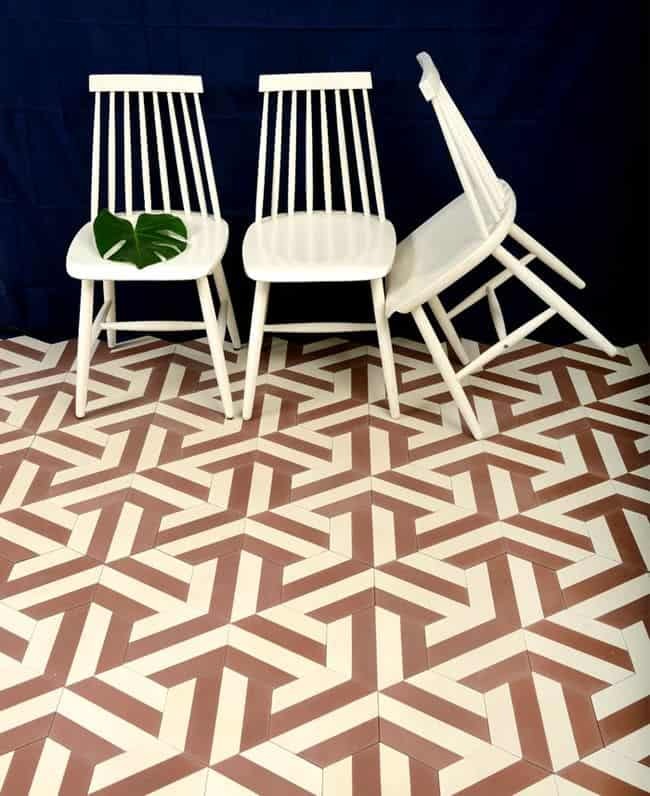 Considering the trend of the use of natural materials, cement tiles are going to be very popular this year. The most trendy color of this season will undoubtedly be gray. This color does not have to look boring, it works wonderfully in a rich variety of shades and tones. No more tiles or shiny surfaces. Matte, either in earthy or neutral colors, is increasing. You can use these colors to combine with the darker grays, and introduce some contrast to the total color scheme. You can also use shades of pastel blue or green to add a touch of color. The marble cladding for metal walls and accessories in shades of brass and gold is another trend. An elegant return to the aesthetics of the 70s in the combination of colors and tones. Here is an example of how the nobility of stone in combination with minimalism and other natural materials can make up a truly elegant and contemporary environment. Geometry becomes important in architectural and structural details, but also in tile or tile coverings. 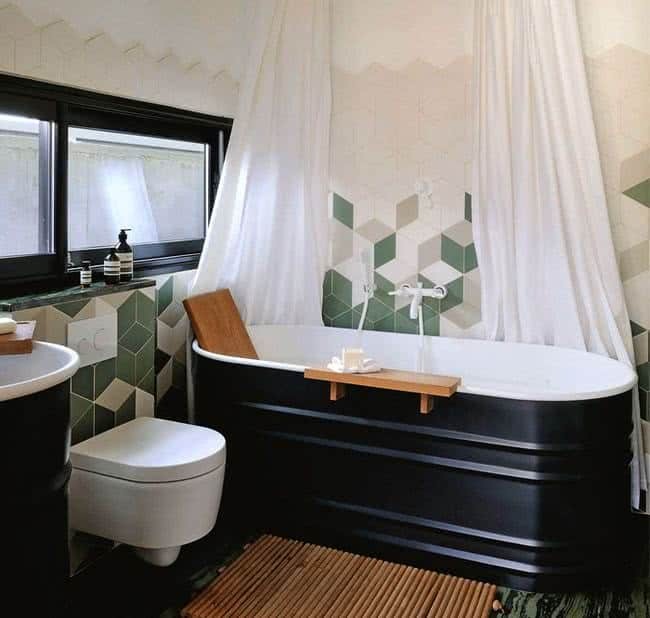 This hexagonal shape of the tiles is a trend that will surely extend several years and a very popular design combination with multiple variations. You can even achieve 3D depths. The shape and size of the toilets and bathtubs are greatly reduced, not only to fit better in smaller urban apartments, but also to introduce a sense of restricted elegance and intimacy. The heating designs for bathrooms bring very original proposals, as you can see in these photos. 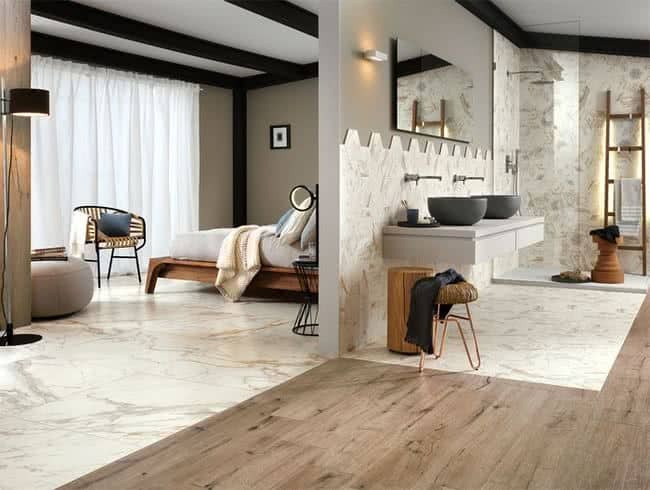 The most commonly used elements today are wood, glass, large tiles, both in the floor or to coat the wall, and much cement or materials of similar texture and color. 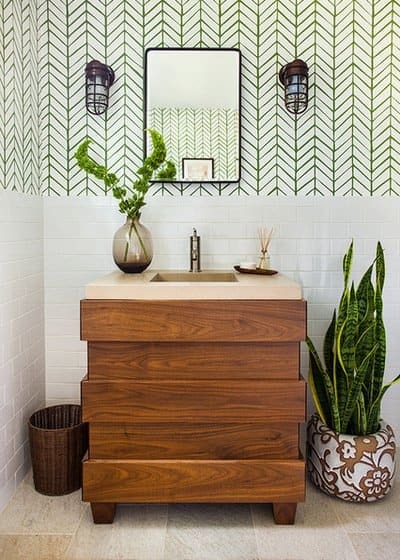 The woods will continue to flourish in modern bathrooms. The launch of new wood products of special design, allows us to bring their natural heat into a space where the use of this material was taboo. It can be used on walls or countertops. Wood is not the only natural material that will be a trend in the next year. Earthy materials such as natural stone and river stone, not simply on the floor and walls, but also on countertops, washbasins and bathrooms. It is played with the majesty of natural materials and minerals that contrast each other, which offer us visual and tactile texture in a room that has become a sanctuary. Metal has been an important interior trend in recent years, and it seems that it will not be falling into disuse. Metals offer glamor and contrast with natural materials. They reflect light and inject style, whether with an industrial touch or a touch of glamor. Metals with matt or satin finishes will be especially popular this year. The cold tones that create a calm atmosphere, will be trend in 2019. Some of the best options for cool shades are blue and emerald green. They combine with white and touches of wood for a fresh sensation, with metallic details and rustic materials for a more sophisticated design. 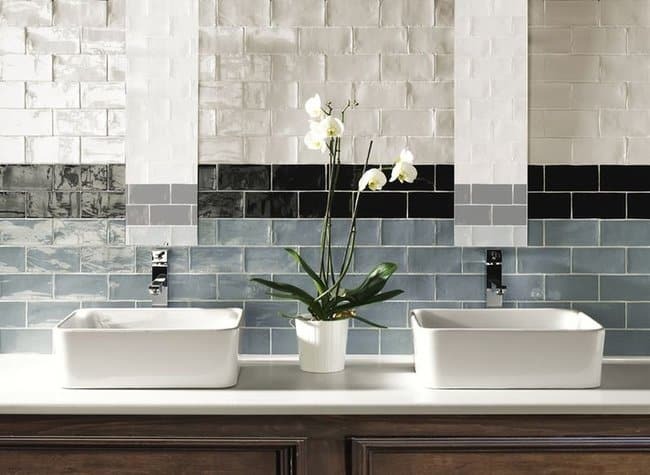 White is the predominant color when it comes to bathroom accessories. White helps create a fresh and contemporary environment. Use white accessories to complete a clean appearance, contrasting with the walls or cabinets. 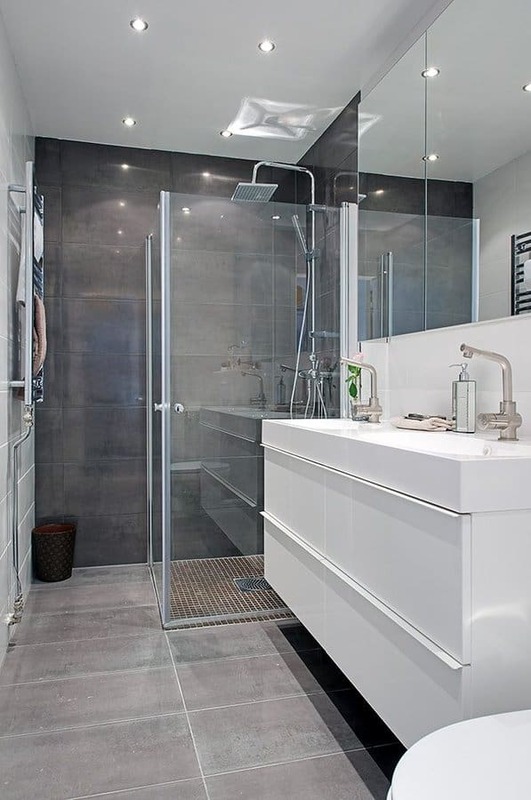 The gray color will continue to be widely used as the predominant tone in bathrooms. Everything is based on a style of straight lines, spacious, a lot of work with mirrors, stainless steel, shades of black, white and neutral. 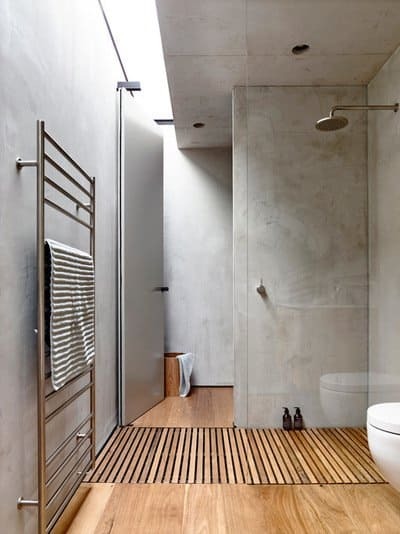 Simplicity reigns in modern bathrooms, with a good deal of minimalism. Simplicity not of comfort but visual; order, no extra furniture or accessories, all in the same color or same tone. This will surely be good news for renovators who detest exaggerated clutter and design, in favor of a clean, practical and efficient look. Make sure there is adequate storage to hide the hair dryer and lotions. The elements that are not functional are hidden, allowing an orderly and quiet environment. 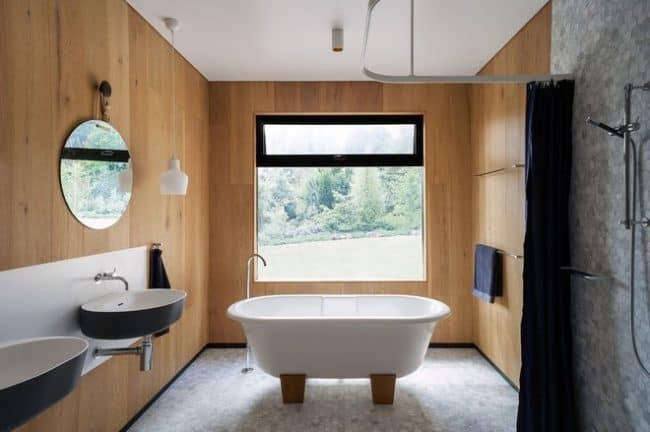 The bathroom is no longer purely functional, but also a place to escape, and this will be seen in custom-made furniture and ambient lighting. 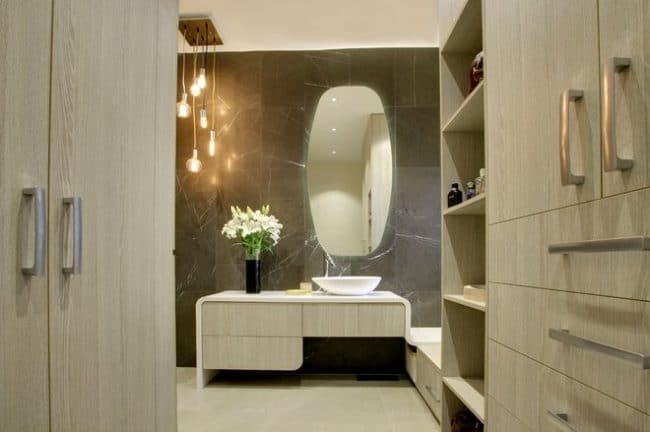 A beautiful dressing table, with a stool to put on makeup in the bathroom, will make you feel very comfortable. Think of stools, armchairs, poufs, bath mats and hanging lights. Industrial design is increasing. The use of cement, sandy or soft as silk if you opt for a polished finish, not only on the floor of the bathroom, but as a wall finish. But keep in mind that concrete can make a space look cold and hard. The introduction of texture contrasts such as wood, natural fibers and plush bath mats and towels will help to soften the appearance and add comfort. 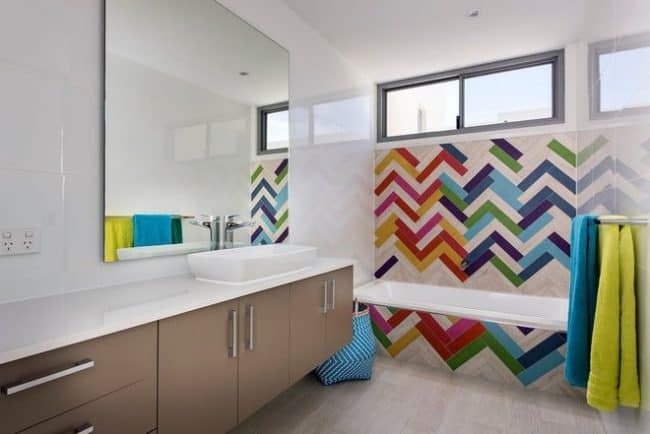 Forget about mass-produced tiles, now custom-made handmade bathroom tiles are trend. Beautiful for their imperfections, they infuse a rich texture, as well as visual appeal. The contrasting texture of the handmade tiles and the natural grain of the stone are very complementary. Large tiles have the advantage of creating a seamless spatial illusion. 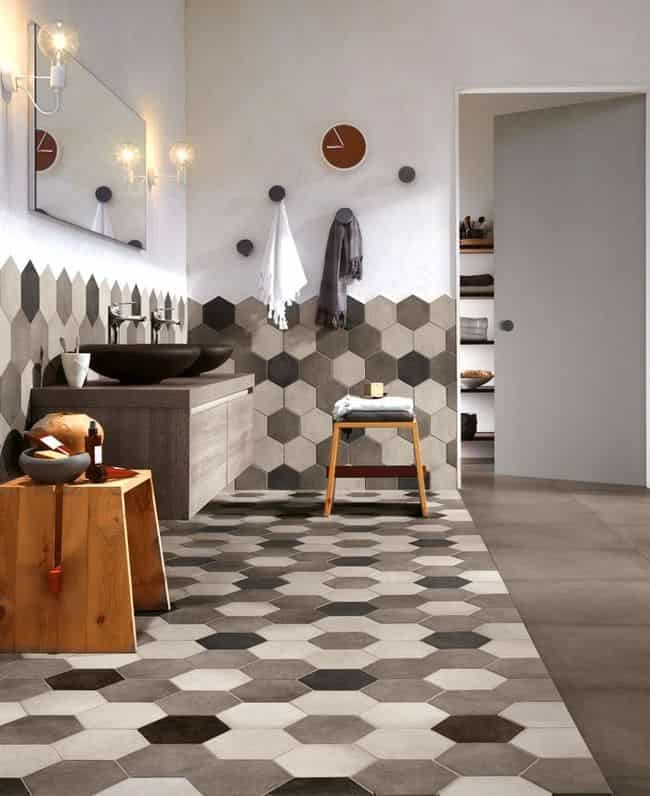 Geometrical patterned tiles may have been very popular in recent years, but they turn to plain, basic tiles, but with a creative touch, for example, a classic spike design will lend a dose of elegant appeal. Basket braiding patterns will also be popular in modern bathrooms. With regard to the floor, it can be a good option to have heating on the tiles. Otherwise, choose very large square tiles, or travertine marble, or as another option a good design in wood. Rugs can be supplanted by plush wool rugs, as well as Persian rugs. 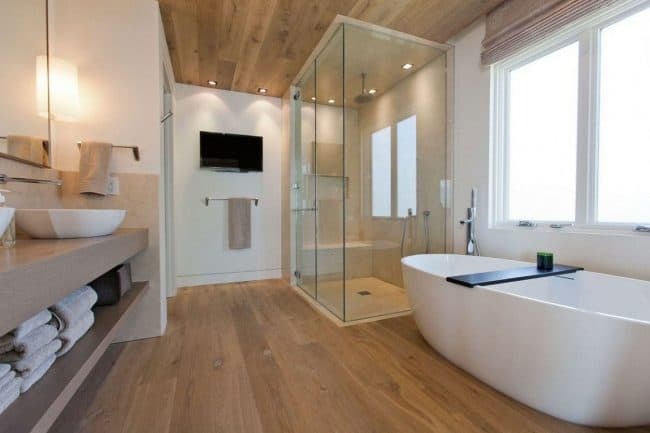 Wooden decks are also one of the great trends in the design of modern bathrooms. They are a wonder for barefoot, since it feels very natural, it is also an element to balance the hardness of the tiles. If we think about what the bathrooms were like a few years ago, we can see how in most of the houses the comfortable bathtub reigned. The bathtubs have always been perfect because they can fill with water and sit for hours and hours until your fingers wrinkle. With the arrival of the shower trays this was left behind, and that modern life makes us go faster and faster, leaving little space for what was once one of the pleasures of life: bath time. But this does not mean that the shower trays of today do not give us many fabulous options. 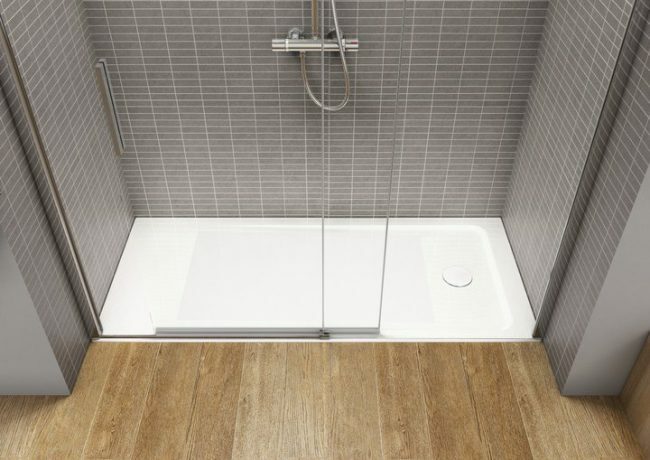 As you can see, the shower trays of today take up much less space than a normal bathtub, but with the advantages that you can walk freely and move more comfortably. The idea of taking a shower with built-in massages, it is a good change for the bathtub, but often it is a luxury that not everyone can access. 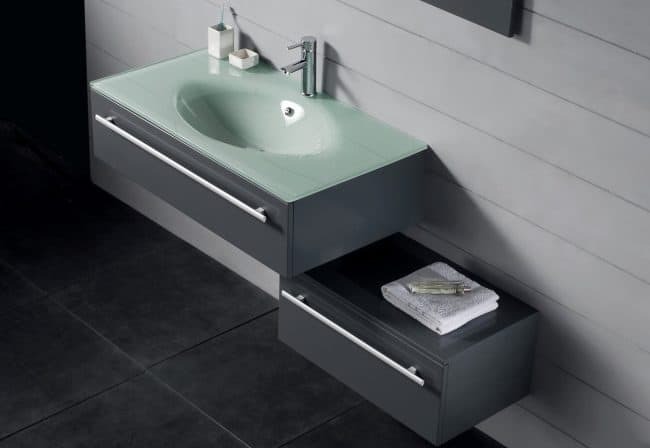 But we show you this option, because it is also part of the great additions in modern bathrooms. An installation consisting of a large shower head and the telephone separately, instead of two shower heads mounted on the same bar. Not only does it offer a more luxurious, invigorating and customizable shower, but it also offers an elegant look in modern bathrooms. Modern bathtubs, on the other hand, also tend to come with a lot of comforts, especially hydromassages. When decorating the bathroom, many times we do not pay attention, without realizing, the number of people outside the house that visit throughout our lives. Therefore, it is important that we take care of all the details as if it were the entrance to the house. 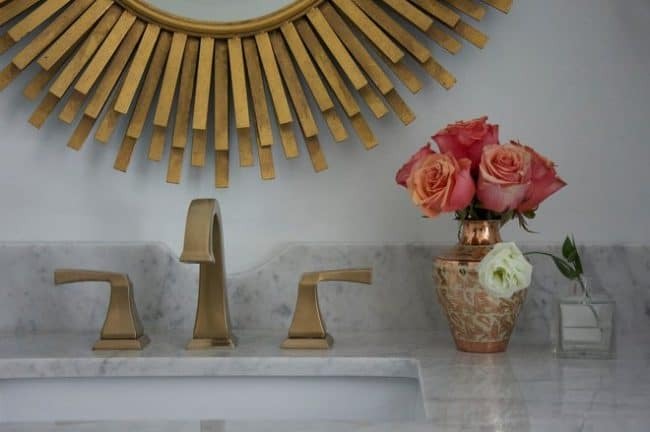 Thanks to the great variety that exists in the market, we can choose from the most classic faucets, to the most sophisticated, everything depends on the style we want to give the bathroom. 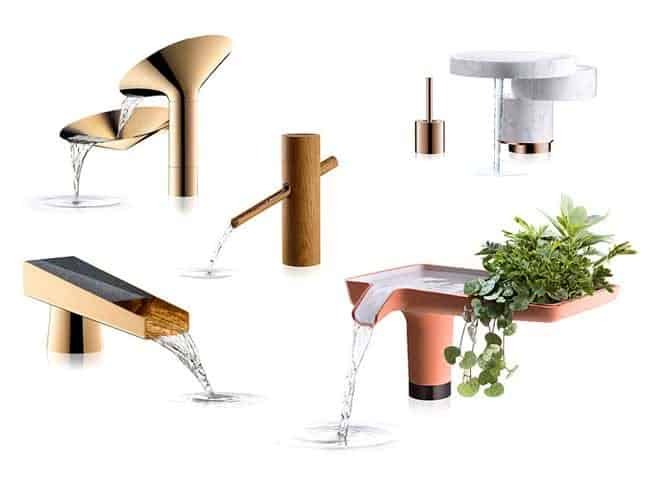 For example, if it is a minimalist style, it is best that we choose to put a very modern tap while if we are going to choose a wood or rustic style, the classic faucet is the best option. If you are going to put a wooden sink, make sure that the support where it is placed, the wood is protected against water, currently there are many paintings that keep them perfect for years. There is a wide variety of designs and materials in the toilets, for example, below we see a concrete wash, one of the trends today. 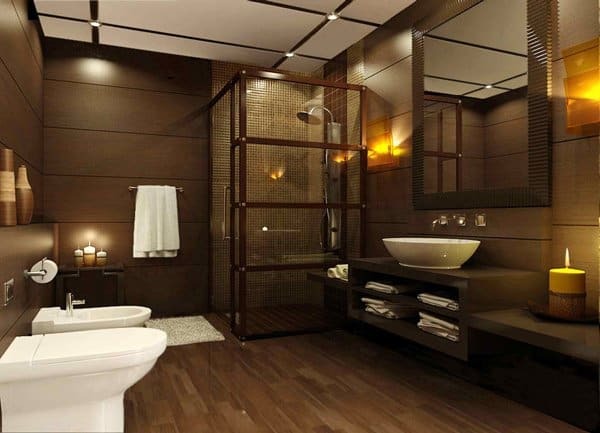 The mixture of materials give a touch to the bathroom super elegant and refined. If we like the zen touches, the latter is a great option. The light that is preferably natural. With regard to the luminaire, the dichroic lights are a very good option since they can be regulated, so as to create a comfortable atmosphere, depending on the occasion. 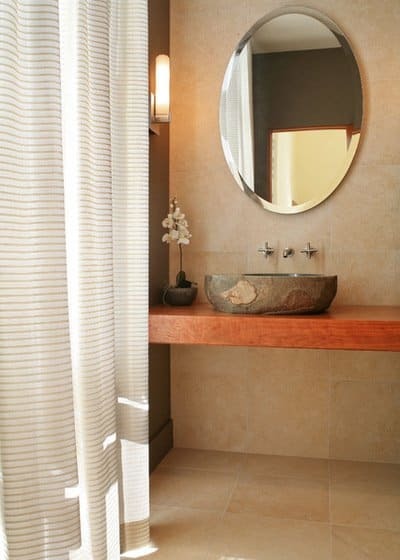 The large mirror is common in modern bathrooms, while the decoration is minimal and can be, for example, two medium-sized candles of strong colors. This was a trend in 2018 and will continue to be so. The indoor plant brings the beauty of the exterior and is part of the design of the bathroom. It is not a simple accessory, but an integral element, which can be changed with the seasons. These are some bathroom models that you can find at Leroy Merlin this year. 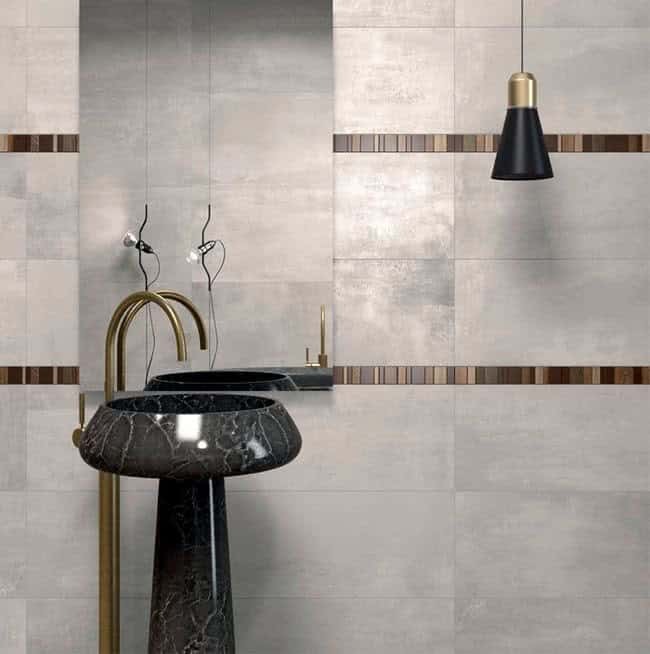 The company Porcelanosa, world reference in a very varied range of products, among her, many related to the bathroom, is a reference in what refers to the latest trends in design and decoration of modern bathrooms. 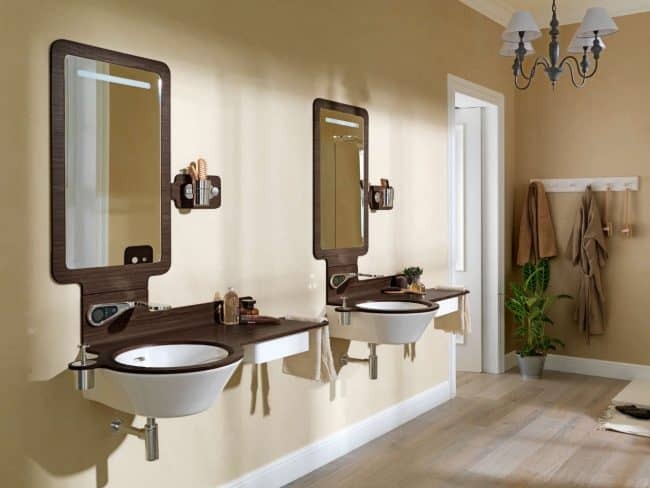 The specialty of the company is in its most modern d esigns of hydromassage bathtubs, shower trays, taps, toilets, screens, coatings and all kinds of bathroom furniture. At the same time it proposes a very wide number of models, designs and styles, all with the same level of quality and technology, as well as the best value for money. Without more words we leave some photos to enjoy them. Agape is one of the world’s leading companies in bathroom decoration and construction. Their pieces and materials are diverse, as well as always have the best bet on the design and quality of their products. Since it is another of the trend-setting companies in modern bathrooms, it occupies a place in this article. 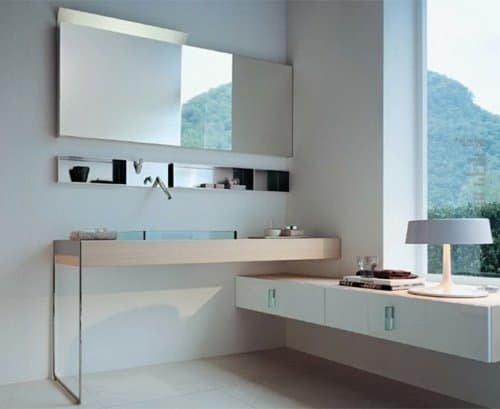 Rectilinear shapes are a common feature in bathroom furniture, both shelves and overhead shelves to place the sink. The materials can be wood, ceramics and marble, among others. 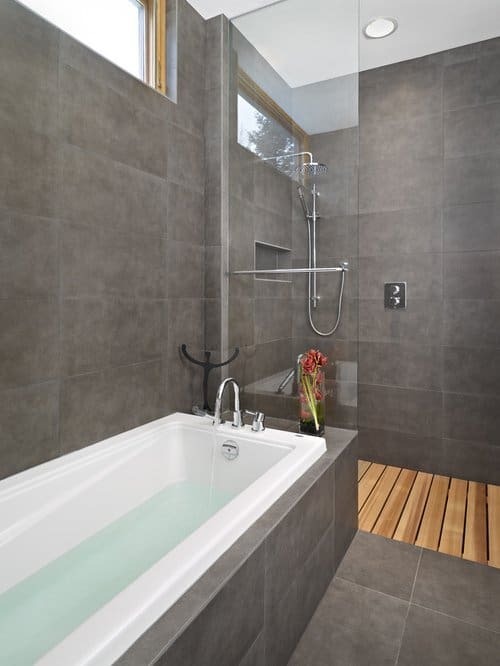 The showers offer avant-garde designs, pointing to common glass that can be seen from one side to the other and with the difference that they are installed at ground level, without the need to add a marble separator, to prevent water from spreading through the rest the bathroom. But if you are looking for vats, then there you will find a wide range of possibilities and especially designs, usually made of ceramic or rock. It offers shapes that go from the classic rectangle, to cone-type circles, which are very interesting. The most remarkable thing is that the company does not fit into a specific segment of decoration, but within each piece of furniture, you can find different models, which manage to capture all customers, since there is always an option for each. 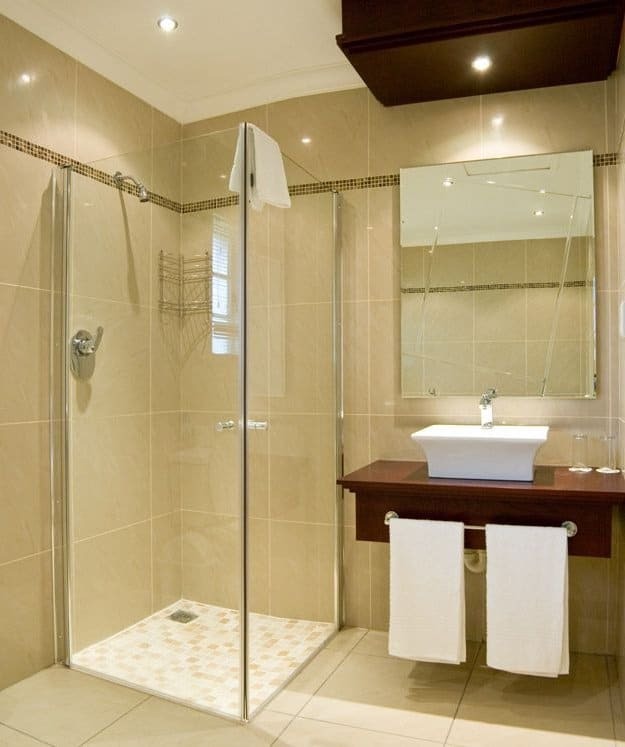 Decorating the bathroom or renovating it is easy, if you choose the details you require. 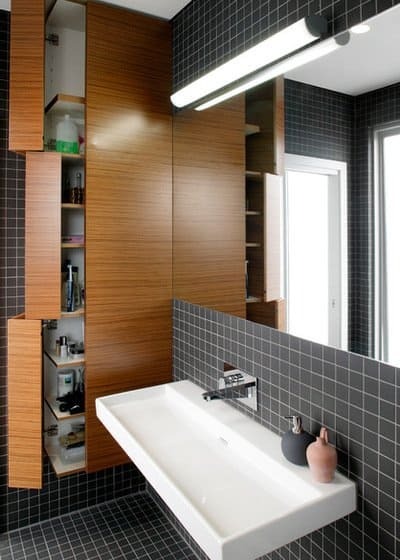 Today we give you great ideas to create an attractive bathroom but also provide a maximum of functionality. This is the Gamma proposals for bathroom decoration. 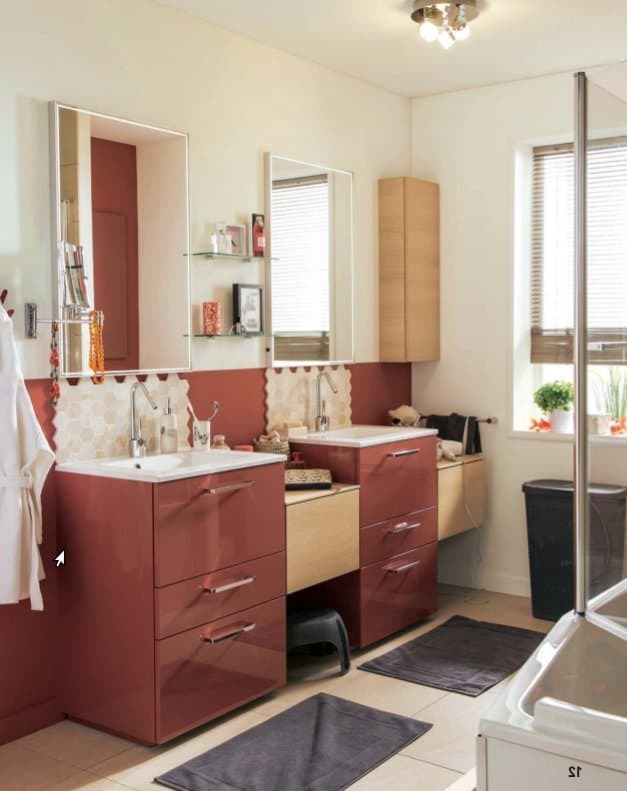 Functional designs and colorful details that will give your bathroom a modern look that will make it become another of the admired rooms of your home. 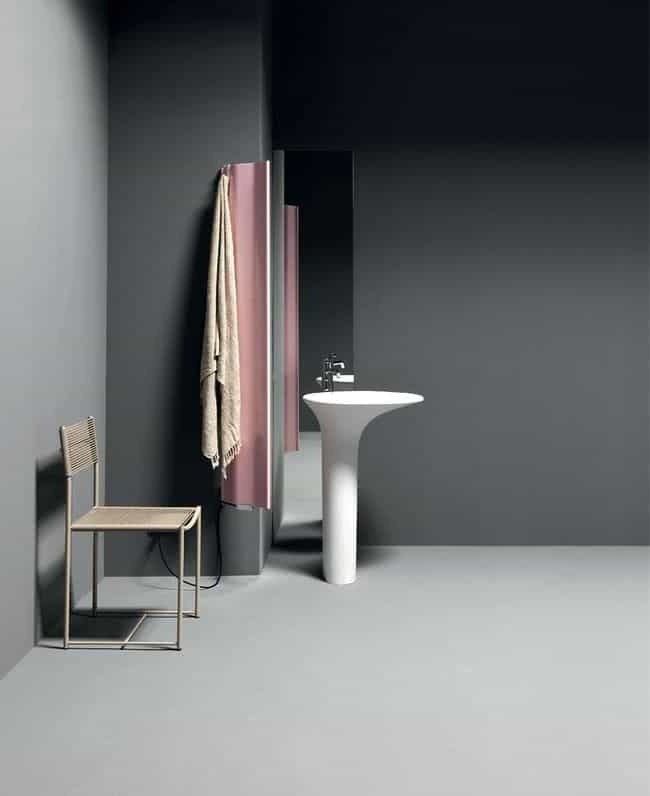 The collection of Gamma, are a beautiful selection of the most original designs for the bathroom, but also the most functional hygiene equipment, as well as the maximum color so that the bathrooms are no longer boring rooms but rooms of comfort and relaxation. 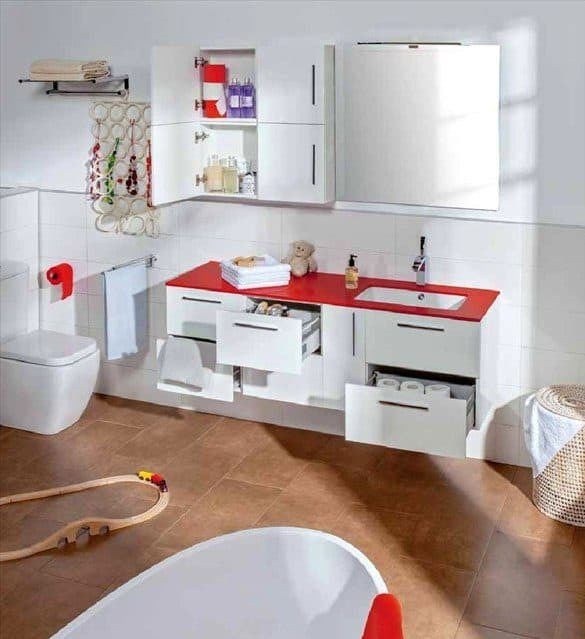 Many styles of toilets, toilets, showers and taps, so that everything is modern and according to the particular needs of each one. 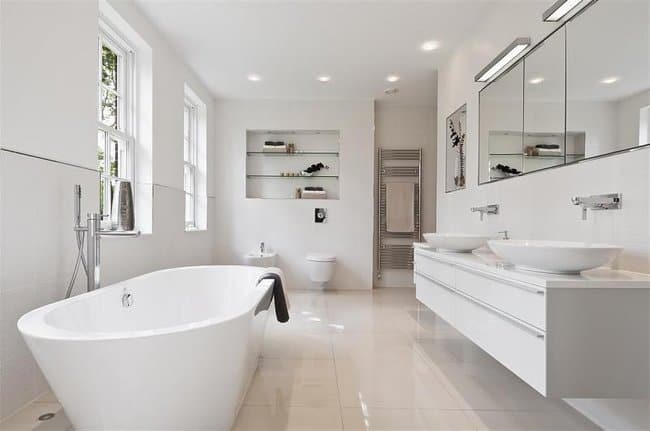 We can think of decorating bathrooms of any size, and we can also have safe bathrooms because this aspect has been carefully considered along with the attractiveness. Super colors like cherry, oak and white are just some of the many that can be chosen. 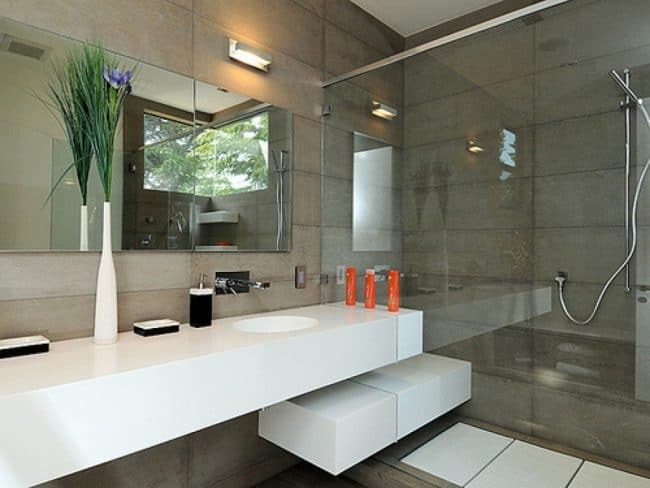 So let’s see the images and do not deprive yourself of having, you also the most beautiful of the bathrooms.